Shitalpati is one of the most distinguished traditional rural handicrafts of Cooch Behar. It is also manufactured in the states of Tripura, Assam and in neighboring Bangladesh.This particular quality of mat is particularly suited for the warm and humid climate of this part of West Bengal, being a thermal insulator and damp proof. Shitalpati mats render a feeling of coolness (thus rendering the name `Shital` which means cold) to the person sitting or sleeping on it, and are intimately linked with everyday rural life. Shitalpatis have been immortalized in nursery poems - being mentioned as one of the incentives given to baby sitters in a family. The aesthetic appeal and utilitarian value of these mats have made them increasingly visible in large towns and metropolitan cities thus expanding their traditional market beyond their traditional rural confines. In West Bengal the most important centers of Shitalpati are Barokodali, Ghughumari and Nakkati-Pushnadanga in Cooch Behar district. Shitalpati is one of the most distinguished traditional rural handicrafts of Cooch Behar. It is also manufactured in the states of Tripura, Assam and in neighboring Bangladesh. This particular quality of mat is specially suited for the warm and humid climate of this part of West Bengal, being a thermal insulator and damp proof. Shitalpati mats render a feeling of coolness (thus rendering the name `Shital` which means cold) to the person sitting or sleeping on it, and are intimately linked with everyday rural life. Shitalpatis have been immortalized in nursery poems - being mentioned as one of the incentives given to baby sitters in a family. 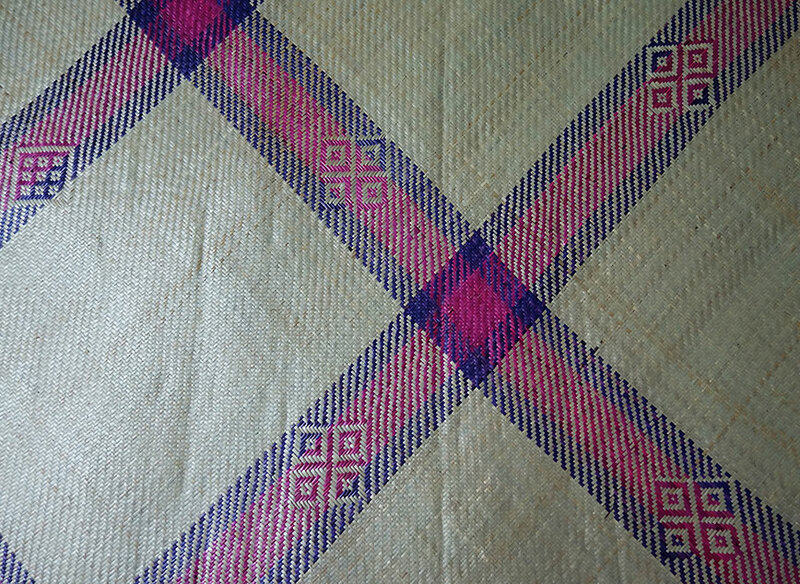 Historically, Shitalpati mats used to be a unique craft of East Bengal (present day Bangladesh) and was very popular across all of eastern India since the medieval period. A finer variety of it used to be exported to the Middle East. After the partition of India in 1947, about 18 out of 35 thousand artisan families who used to depend on making Shitalpati came away to West Bengal. 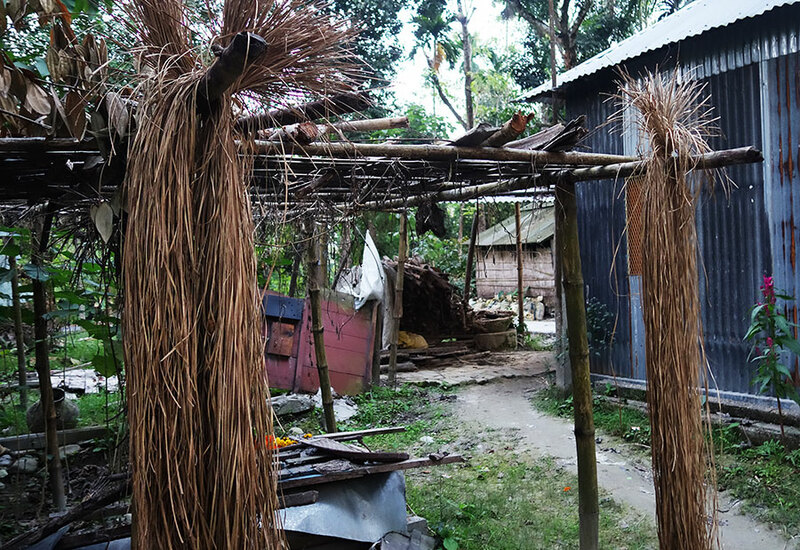 In West Bengal, the hub of Shitalpati making is at Ghughumari in Cooch Behar. Other important centers are Barokodali, and Nakkati-Pushnadanga also in Cooch Behar. 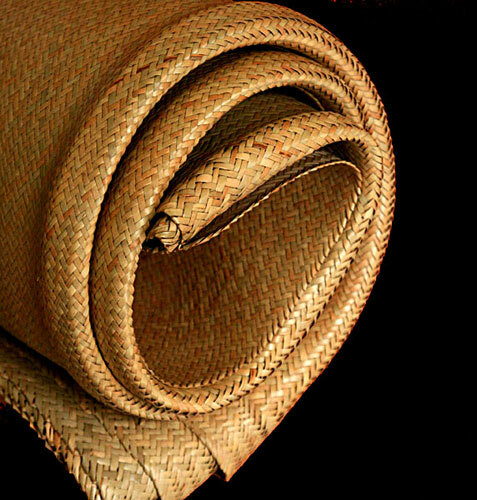 The mats are chiefly woven by the women, while the men handle the complicated processing of the cane splits. The weavers belong primarily to the Kayastha caste, not a traditional folk artisan caste. The manufacture of the gorgeous Shitalpati involves many complicated processes. 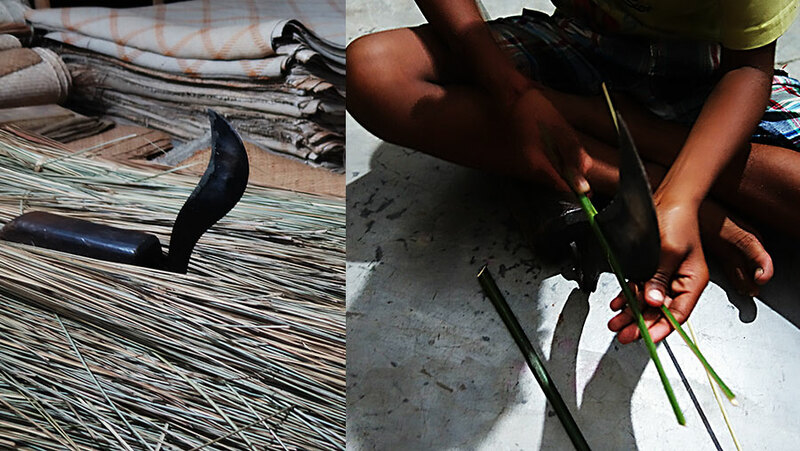 The most difficult part of it is the preparation of fine cane slips fit for the Shitalpati weaving. 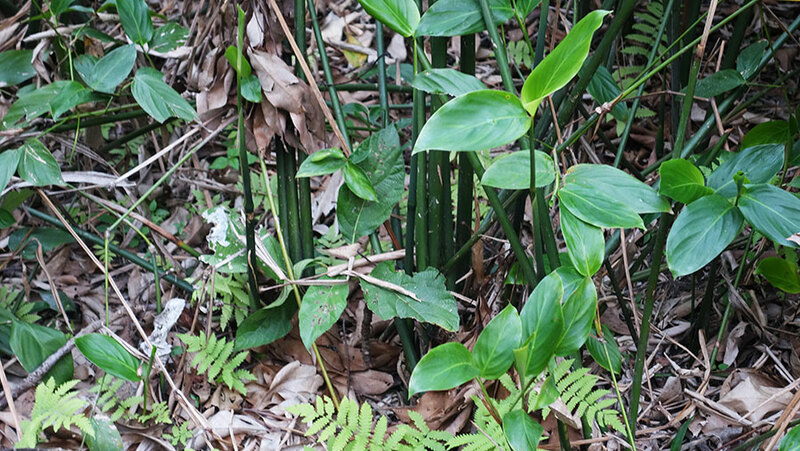 The raw material is the Murta cane (Maranta dichotoma) which grows wild in the marshy areas of Cooch Behar. The plant lives for over 40 years and gives harvestable sticks about seven to eight feet tall, once every three or four years. Nearly 200 to 300 sticks of cane are required for a single shitalpati. After the cane is cut, each reed is first split lengthwise into about 15 or more equal splits, using a bill hook with a foot long blade, called a ‘dao’. The more the splits, the finer will be the eventual weave. However, the canes used for Shitalpati or its finer variant, Bhushnai, have to be carefully selected. They need to be blemish free and therefore are not found in plenty. Mats woven from these canes are thus far more expensive and the cost of a Bhushnai mat can vary from Rs 3000-10000 - depending on the complexity of the weave and the motif.  Each split is further pared longitudinally into three strips. The topmost strip will be skillfully joined and interlaced with similar strips to make the Shitalpati, after being appropriately seasoned. The paring of the topmost split is a skilled art - the finer the strip, the softer will be the mat. The finest strips will go into the making of the Bhushnai quality, which is superior Shitalpati. 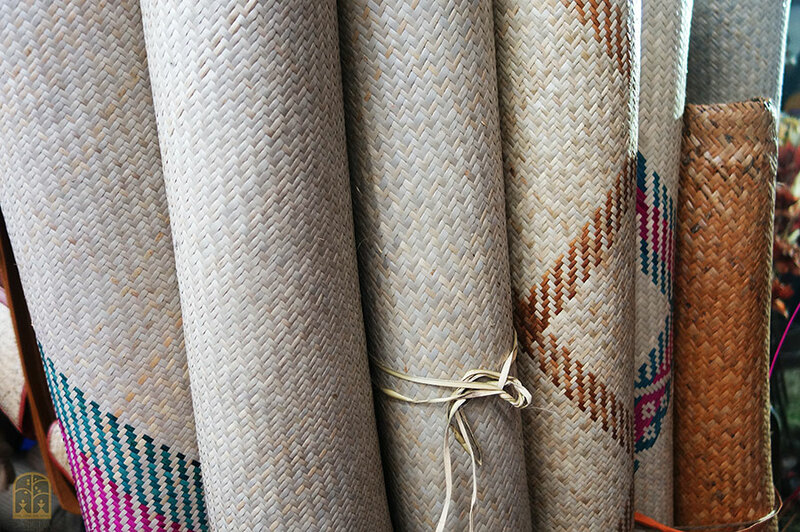 The middle strips are of a rougher quality and are used to weave regular mats or baskets. The ordinary mats could be small floor mats for seating guests or regular sized ones for household use. The bottom strips are usually discarded or kept aside for miscellaneous uses. The natural colour variation from cream to brown of the Shitalpati depends on the seasoning process. The ivory shade of the smoothest and softest variety is got by soaking the topmost strips in rice starch for several days and then boiling it in the same water. The splits for the light brown mats , which though referred to as Shitalpati are not actually "shital", are left to dry in the open air, night and day over several days, until they change colour from green to brown. For coloured motifs and patterns, the strips are dyed with usually chemical colours. 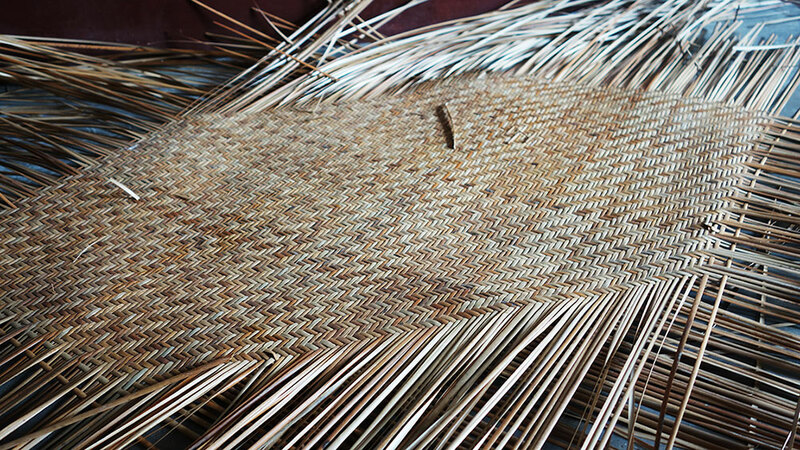 The entire process from cutting the cane until the splits are ready for weaving is extremely laborious and can take anything from 7 to 15 days. However, where the mat is not so fine, the processing time is much less - a day or two, even. Before the weaving begins, the strips are soaked again in water, the sun dried strips for about 10-15 minutes and the boiled strips for just a bit, so that they are soft enough to weave. The flat strips are woven in simple check patterns, with slight variations in pattern - zigzag, diagonal, twill or diamond. The quality of the end product is determined by how the cane is seasoned since that affects the gloss, malleability, durability, smoothness and the time taken to weave it. It is believed that the best Shitalpati is one over which even a snake cannot glide since it is so slippery smooth. The skilled weaver combines the coloured weft with the cream warp to create a design band at the edge. The strips may not be long enough to last through the weave; so new strips are overlapped and woven in a way that does not require joinery. Complex patterns of temple spires, mangoes, animals, birds, stylized human figures are some of the motifs created by placing one set of strips diagonally and another set in the opposite direction. Many patikars (shitalpati weavers) prefer to weave only the standard checked uncoloured variety. A standard 4x6 feet Shitalpati needs over 12 hours of labour by three persons, whereas Shitalpati of the finest grade would need up to a month’s effort by an entire artisan family. Narayan Chandra Dey was the first state awardee of the district. He was the one who introduced motifs (namksha) into shitalpati weaving. Being a part-time taanti (cotton sari weaver), it occured to him that he could reproduce the woven motifs on a sari on the shitalpati. He was succesful in his experiment and it was for this that he received the state award. Since then, Tagar Rani Dey, Aruna Dey, Geeta Pal, Jyotsna Dey, Gauranga Shikdar are some of the villagers who have won state and national awards for their artistic excellence. 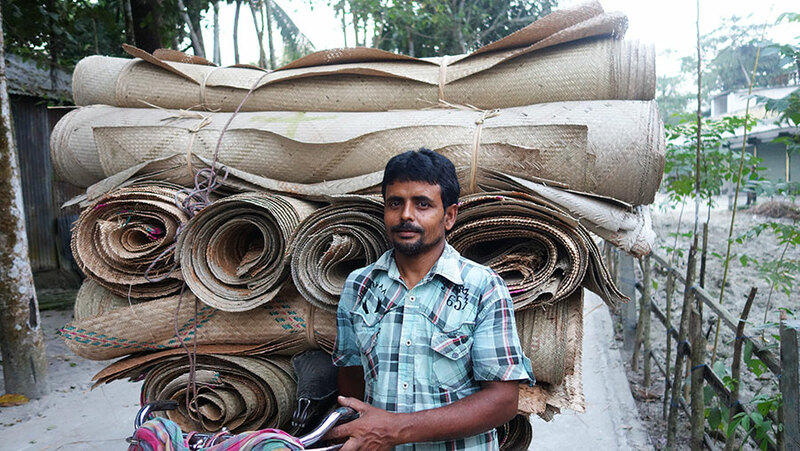 With electricity in most rural homes, there would theoretically be a lesser demand for these “cool” mats – but the fact is, villagers still prefer these natural mats in the hot summers of West Bengal. Thus for the Shitalpati makers, the summers are better for business, relatively. In the last few decades, the demand for Shitalpati has seen an upsurge in metros and other urban markets, thanks to its aesthetic appeal and utilitarian value - with the highest demand coming from Assam followed by Kolkata and Delhi. The boost has also been due to product diversification and there are now many factories in Cooch Behar manufacturing bags from Shitalpati. But this medieval art of mat-making is faced with a the invasion of plastic-based mats, which has eaten into a sizeable portion of the unorganised Shitalpati trade. This has been made worse by a lack of marketing support. Further, many of the artisans do not have land to cultivate the cane and are compelled to buy the cane. Daily earnings from weaving are meagre; the profit made from an average grade mat of 6` x 4` which is woven by three people over two days is often a paltry Rs 100. As a result, many families that have traditionally been engaged in Shitalpati-making for generations together, are hard put to ensure that the younger members carry on the tradition. The restriction in cultivation of Murta adds to the woes of the artisans while, in the absence of adequate retail pricing, the finest grades have become almost extinct. Aware of the situation, the government and a few NGOs are trying to help, encouraging the artisans to produce diversified products for the contemporary urban market like bags, belts, mobile covers, shoes etc. and also to form self help groups (SHG) to gain easier access to bank credit. The government is also trying to make Shitalpati occupy a sizeable portion of basketwork and wickerwork exports. There are more than 10,000 weaver families in Cooch Behar I & II Blocks and a society has been formed by the community. There is one national awardee and many state awardees in the district, but overall qualitative output remains an issue that needs attention.